NEW YORK, New York, September 14, 2017 (ENS) – The elusive snow leopards of the high Himalayas have been listed as Endangered for the past 25 years on the authoritative Red List of Threatened Species kept by the International Union for the Conservation of Nature, IUCN, but that has changed. The IUCN has upgraded their conservation status one level to Vulnerable, which means still at risk of extinction but no longer in danger of immediately going extinct. 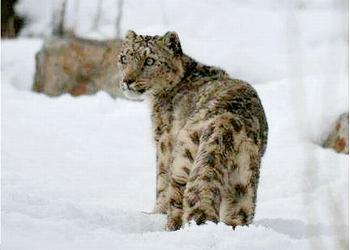 The change in status came after a three-year assessment process by five international experts, including scientists from academia and from Panthera, the Snow Leopard Conservancy, and the New York-based Wildlife Conservation Society, WCS, all organizations active in snow leopard conservation. Their assessment was then reviewed and approved by eight international felid and Red List assessments experts, as well as the IUCN’s Global Mammal Assessment team and central Red List Unit. “To be considered ‘Endangered,’ there must be less than 2,500 mature snow leopards and they must be experiencing a high rate of decline. Both are now considered extremely unlikely, which is the good news, but it does not mean that snow leopards are ‘safe’ or that now is a time to celebrate,” said Dr. Tom McCarthy, executive director of Panthera’s Snow Leopard Program and a member of the assessment team. “The species still faces a high risk of extinction in the wild and is likely still declining – just not at the rate previously thought,” said McCarthy. Other population estimates calculate between 3,920 and 6,390 remaining snow leopards. A “conservative” estimate puts wild snow leopard numbers at 4,000, says Dr. Rodney Jackson, eounder and director of the Snow Leopard Conservancy and a member of the assessment team. All these facts were presented at the International Snow Leopard and Ecosystems Forum held in late August On August 29 in Bishkek, Kyrgyzstan. The forum closed August 29 with all 12 snow leopard range countries uniting to increase efforts to secure a future for the species and its habitat, on which hundreds of millions of people downstream depend for clean water. The forum set the stage for critical talks on climate change and unsustainable infrastructure development, both threats to snow leopard existence and Asia’s water supply. At the forum, snow leopard range countries built on the ambitious goal set in 2013 to secure 20 snow leopard landscapes by 2020. The snow leopard is the top predator of Asia’s high mountain chains – the Himalaya, Karakoram, Hindu Kush, Tien Shan, Altai, ranging over more than 1.8 million square kilometers of mountain habitat in 12 Asian countries. Snow leopard habitat covers the headwaters of 20 major rivers, sources of drinking water for people and animals on the teeming plains of south Asia. 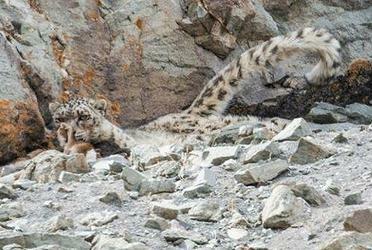 Even in these near-inaccessible mountains, snow leopards face numerous threats. Poaching, habitat destruction, loss of prey species – these are threats that continue and new threats, such as roads, border fences, and climate change, are increasing. “Continuing threats include poaching for its thick fur and overhunting of its wild prey,” said Peter Zahler, coordinator of the WCS Snow Leopard Program and also on the assessment team. He says that when the snow leopards lose their wild prey, they can attack domestic livestock, which can lead to retaliatory killing of snow leopards by local shepherds. “The IUCN’s Vulnerable status means a species is still vulnerable to extinction, and the snow leopard population is still believed to be in decline and facing a high risk of extinction,” he said. 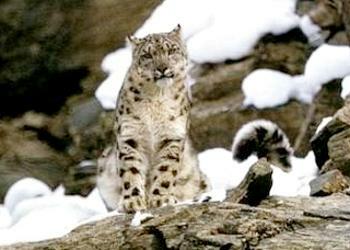 One of the reasons that snow leopard status has improved is increased conservation efforts, the experts agree. One of the most influential voices is diligent and reclusive scientist Dr. George Schaller, who was a pioneer in the study of snow leopards and their prey, the blue sheep, known as the Himalayan Bharal. Schaller’s work has contributed to the establishment of many parks and preserves including the Shey Phuksundo National Park in Nepal, inhabited by a small population of snow leopards. Schaller, now 84, is vice president of Panthera Corporation and serves as chairman of their Cat Advisory Council along with conservationist and Panthera CEO Alan Rabinowitz. Schaller is also a senior conservationist at the Bronx Zoo-based Wildlife Conservation Society. Dr. David Mallon, snow leopard expert and member of the assessment team, points out that in the last few decades there has been a significant increase in the number of protected areas within the snow leopard range. Local initiatives such as community ranger monitoring efforts and the building of predator-proof corrals to control livestock losses are helping to protect the cats from retaliatory killing in some locations. During the forum, Nepal showed the highest level of commitment towards snow leopard conservation by becoming the first country to launch its climate-smart snow leopard landscape management plan. “Nepal has once again established itself as a leader in conservation, showing much-needed ambition despite facing some of the toughest environmental, economic and political conditions,” said Ghana Gurung, conservation director at WWF-Nepal. To coordinate conservation efforts on behalf of snow leopards and all big cats, Panthera announced August 23 that it has convened more than 60 respected figures from the worlds of business, law enforcement, government, fashion, media, entertainment, tourism, the military, and the arts in its Conservation Council, a global advisory board. Among the Council’s members are influential leaders in many fields, including actors Jeremy Irons, Glenn Close, and Jane Alexander; General David Petraeus, Sir Norman Rosenthal, and artist Maya Lin, singer Shania Twain and conservationists Kris Tompkins, former CEO of Patagonia outdoor stores, as well as New York Fashion Week creator and co-creator Fern Mallis and Stan Herman, author Wilbur Smith, ProPublica’s Andrew Revkin, the BBC anchor Kate Silverton, and MSNBC political analyst Nicolle Wallace.